The TORT Centre today (30/1/2017) received delivery of a new 3G artificial turf surface for sports-based research purposes. The material, supplied and manufactured by TigerTurf™, is used on synthetic football surfaces and is rigorously tested to FIFA standards. A layer of recycled rubber at the base of the fibres absorbs impact and adds resilience, and accuracy of ball bounce control. The high-performance turf will allow for continuing sports-based research to be carried out at the TORT Centre affording more realistic playing qualities and more reliable surface feedback for grass-based sports analysis. Current research projects already earmarked to utilise the 7 x 4 metre surface include an investigation of how to minimise knee joint damage during the shinty swing phase, research comparing lower limb biomechanics of integrated knitted football boots with classic football boots, and the investigation of rugby concussion and protective headgear. 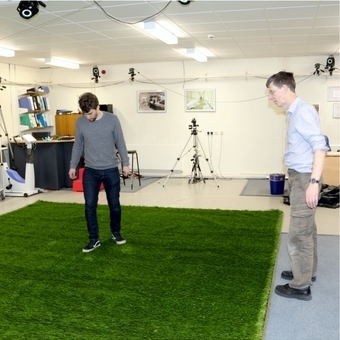 Calum MacDonald (Laboratory Technician) and Dr Graham Arnold (IMAR Technical Manager) unrolling the 3G turf in the Gait Analysis Lab at the TORT Centre. Professor Rami Abboud, Director of the Institute of Motion Analysis & Research (IMAR), stated: “Here at TORT we continually strive to improve the research facilities so that students can confidently conduct their studies in one of the leading motion analysis labs in the country in the safe knowledge that their results will be robust and academically sound. The addition of the new 3G surface will allow us to test sports in a controlled manner using the latest high-tech Vero Vicon cameras”.